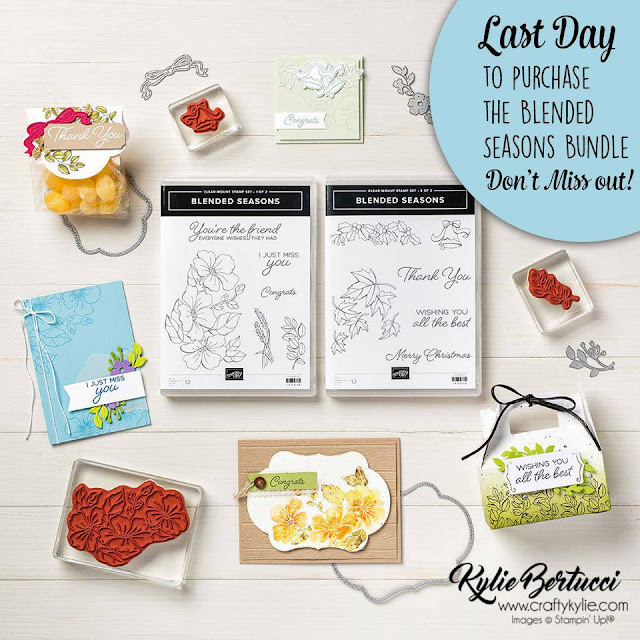 Kylie Bertucci Independent Demonstrator Australia: Crazy Crafters Team Highlights September 2018 | LAST HOURS Blended Seasons!!!! Crazy Crafters Team Highlights September 2018 | LAST HOURS Blended Seasons!!!! Welcome to my Crazy Crafters Team Project Highlights for the month. I love highlighting my team - they are so talented and I am so proud of them. Additionally, these are the LAST HOURS for the Blended Seasons. Scroll to the bottom for more info! Check out the amazing work that they have done this month. You can vote for your favourites and I will announce the top three on my blog. You vote by clicking the heart in the top right hand side. You can click on the image and this will take you to their blog where you can find out more about their project. Feel free to leave comments for them if you really like their project. It means so much to hear from people that read our blogs. Aren't they amazing?? The Crazy Crafters Team really has some incredible talent. Just a few more hours until this bundle is NO MORE! Buy it now or regret it!